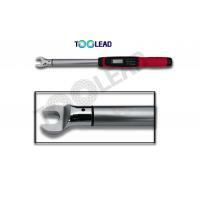 Home Companies Shenzhen Toolead Precision Tools Co., Ltd.
TS series products can observe and control thread tightening moment, measure the connection, verify and calibrate torque, which are widely applied in industries such as space flight, aviation, automobile, railway, bridge, ship, machine tool petroleum and so on. 1. Intelligent alarm: work parameters can be set according to tightening and testing precision. 5. The needed torque heads can be quickly replaced and it suitable for many kinds of screws.